Roof damage doesn’t just mean you’re dealing with old, worn out shingles. Damage to the chimney structure is quite common as well, with many culprits behind it. Over time, chimneys tend to develop cracks and crevices that allow water to permeate them. Additionally, the sections of metal applied at the seams between the chimney and roof — called roof flashing – may come loose or break due to high winds and other inclement weather. Improper chimney flashing installation can also open up your roof to early deterioration. Chimney leaks are the primary form of damage you will notice from a faulty chimney flashing installation. Instead of keeping rain and snow out of the roof seams, sub-par flashing allows the moisture into the roof’s inner structure. Water seepage can cause mildew, mold and premature aging of the roof. If you have a chimney, regular maintenance, yearly inspections and prompt repairs are a must. You have to be proactive if you want to avoid nasty chimney leaks or, worse, damage to your roof caused by chimney problems you ignored for too long. Problems cause by damaged chimney flashing can be mitigated through regular roof inspections & effective repairs. Leaky chimney problems can quickly become costly, and may include drywall warping, ceiling stains, insulation saturation, mold growth and interior home damage. That’s why we recommend annual inspections handled by a professional. When you hire a roofing inspection contractor to check the integrity of your roof, they will inspect not only the roof, but also the chimney, vents, skylights, all areas of flashing, and your home’s drainage systems. If there are any problems with the chimney, such as broken bricks, loose mortar joints, cracks around the chimney foundation, or deteriorating flashing, prompt repairs should be your next priority. Chimney flashing needs to be replaced when it becomes rusty, corroded, chipped, or broken. Masonry caulk can seal small gaps or holes on a short-term basis, but is not designed to take the place of the flashing. Depending on the state of the flashing, part of the chimney and surrounding roof shingles may also need replacement. 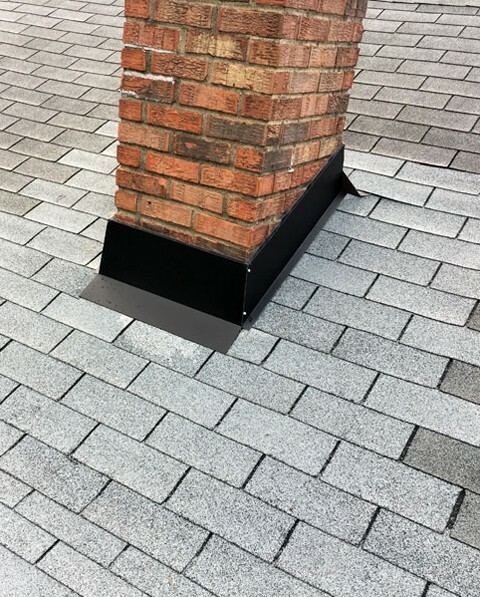 Oftentimes flashing can be repaired – you can follow our simple steps to chimney flashing repairs we’ve covered on this blog. However, if flashing shows signs of rust or other weather wear, your contractor may need to remove shingles to install new flashing. This is not a do-it-yourself undertaking, since improper flashing installation could void your roof warranty. Don’t wait for small problems to develop into damaging leaks – your local contractor can help! If you’d like to schedule a roofing inspection to diagnose specific problems or evaluate the overall condition of your roof, contact All Roofing Solutions. We’re a family-owned contractor with over 15 years of experience in residential and commercial roofing. We offer affordable, expert roof repair, replacement and installation services to customers throughout Delaware and southeastern Pennsylvania. To schedule your free consultation, call 302-725-ROOF (7663) in Delaware or 610-551-ROOF (7663) in Pennsylvania. Don’t forget to ask about our discount of 15% off any roofing repair job! The roof over your head is your home’s first line of defense when it comes to exposure to sun, rain, snow, wind and other weather elements. And if you live in Delaware or any other East Coast state, you’re sure to be exposed to all types of extreme weather conditions, from scorching heat to heavy rains, blizzards or hurricanes. The unfortunate truth is that weather damage is inevitable. Your roof is constantly exposed to the elements, and it is only natural that it will wear and age over time. Rain, snow & ice – Moisture is roof’s enemy #1. It can damage its structure, cause mildew, rot decking and even damage the insulation. While rain is behind most roof leaks, melting snow often ends up re-freezing and forming ice dams, which block proper drainage of water into the gutter and can result in water backing up under your roofing materials. This can lead to serious structural damage. Sun – The most common roofing enemy, sun blasts your roof with damaging rays and heat causing shingles to break down over time. Thermal expansion, IR radiation and UV light from the sun are to blame for the majority of issues related to sun exposure overtime. Wind – High winds lift, curl, and pull shingles away from the roof exposing its underpayment which can leave your roof vulnerable to water damage and significant structural deterioration. The corners, the edges of the roof, and the ridge line are especially susceptible to damage from high winds, but the entire roof structure often ends up getting shredded and punctured by fling debris nonetheless. Hail – Hail can leave dents dislodging the tiny protective granules that typically protect your home from damaging UV-rays and improve the roof’s water-shedding capabilities. Loss of mineral granules can lead to the asphalt coating and even fiberglass matt being directly exposed to the elements which dramatically reduces the roof shingles life expectancy. Lichen – Moss and algae can cause wood rot and structural damage over time while also discoloring your roof. Lichen doesn’t trap as much water against the surface of the roof as moss, but it can be acidic and has strands that can penetrate into the shingles both of which can cause significant damage. Overgrown trees -Tree limbs can become a serious problem puncturing your roof. Leaves that accumulate on your roof can clog your rain gutters and retain moisture. Lack of proper drainage, the presence of water, and excess moisture can cause water to seep into your roofing materials and result in rotting and other damage. A typical asphalt shingles can be expected to last 20-30 years, depending on what they’re made of, weather conditions, quality of installation and maintenance. To prolong the life of your roof, regular roofing & gutter inspections should be a part of your regular roofing maintenance. Homeowners can uncover those visible and hidden signs of damage through regular inspections. We recommend that only professional roofers climb up on the roof, so have your roof inspected by a contractor you can trust to provide an honest assessment. Your local roofer will assess the condition of your roof uncovering potential problems and suggesting steps you can take to increase the lifespan of your roof. And if there are any minor repairs that need to be handled, you’ll be glad to have caught them before they caused significant damage. Homeowners should have their roofs inspected yearly, especially if the roof is 15 years old or older. Schedule Your Roof Inspection Today! Even if your inspection uncovers potential roof damage, it does not necessarily mean that you must re-roof. The age of the roof and the extent of the damage will ultimately determine whether repairs or complete replacement makes more sense. If it’s been awhile since you had a Delaware roofing contractor look over your home’s roof and gutter systems request a comprehensive roofing inspection from All Roofing Solutions, family owned & operated Delaware roofing contractor with over 20 years of experience. We not only offer thorough roofing inspection and professional service but also a piece of mind that nothing was overlooked. Call today at 302-725-ROOF (7663) in Delaware or 610-551-ROOF (7663) in Pennsylvania to schedule your inspection or request your Free Roofing Repair Estimate! Ice dams are a fact of life in Delaware & Pennsylvania – and across America. They can cause major water damage to the exterior and interior as gravity pulls water inside of your home through the wood, insulation, and drywall, causing major structural damage and mold growth. Your best bet against damage from ice dams is to so take the steps necessary to keep dams from forming in the first place. Proper attic insulation & ventilation are the key elements in preventing ice dams from developing – having the right insulation and ventilation will provide the optimal temperature balance in the attic, and prevent the thaw/freeze cycle that causes ice dams. But, what do you do when a dam forms, and you see – or suspect – damage? If you suspect an ice dam developed on your roof, there are things you can do right away to minimize the damage. First, get rid of any built up snow using a roof rake (used for single family homes with pitched roofs) or shoveling it off (on flat roofs, or when there’s a significant amount of snow). Next, remove the ice dam by breaking it free in small chunks. Be very careful here – you don’t want to further damage the roof, or hurt yourself by falling off. If there’s a leak you notice, blow cold air into the attic to freeze it, aiming it directly at the underside of the roof where water is actively leaking in. This will stop the leak in its tracks. Even when there are no obvious roof leaks, you’ll want to carefully inspect your roof & gutters when you discover an ice dam. From the attic, check the underside of the roof sheathing and roof trim for moisture in the area beneath the dam. In addition, take a look at the insulation, and see if it’s damp. You’re also looking for other signs of water penetration, including water stains and mold. Take your time to thoroughly inspect your roof. If you spot problems, have a professional examine your roof surface. Your roofing inspection contractor should be looking for dark patches, missing or damaged shingles, water streaking down the side of the house, signs of uneven melting/freezing, damp attic insulation, sagging boards, signs of mold and mildew – all of these can be signs of ice dam damage. In addition to identifying the source of the leak, your roofing contractor will detail a plan to repair the damage to your roof. If it appears that mold has formed, you’ll also want to contact a contractor who is licensed in identifying and mitigating mold. Mold can be a serious health hazard, and removal is best left to an expert! Remember, always keep safety in mind when working on the roof – especially in winter. Or better yet, hire professionals – removing ice dams can be slow, dangerous work, so hire someone experienced at roofing in all seasons. If you suspect your roof has been damaged and needs repairs – whether because of ice dams or otherwise – the best advice we can give you is to seek out the expertise and advice of an experienced, local roofing contractor. And All Roofing Solutions is ready to help! We’re a family-owned business with over 20 years of experience and offer affordable, expert roof repair, replacement, and installation services to customers throughout Delaware and southeastern Pennsylvania. We pride ourselves on outstanding workmanship and great customer service, and have amassed a list of happy customers who love our work! Call our DE office at 302-725-ROOF (7663) or our PA location at 610-551-ROOF (7663) for your free repair estimate today! And don’t forget to ask about our discount of 15% off any roof repair job!!! Skylights, when installed correctly, can be a functional and beautiful addition to any home. The extra natural light skylights bring can visually expand interior spaces, reduce utility bills and ward off the winter blues. And in winter, most homeowners with skylights appreciate the added warmth a skylight can provide. The problem is, however, that skylights are prone to developing leaks during the coldest and wettest season. In fact, skylight leak repairs are among the most common roof leak repairs seen in residential roofing. Skylight leaks can be an expensive road to major roof, drywall, carpet and flooring damage. Additionally, a leaky skylight may be an indication of more serious, hidden damage – prevention and prompt diagnosis are the first step to maintaining skylight and managing potential leaks! You can prevent winter skylight leaks by performing regular roof maintenance and timely inspections. What Causes Skylights To Leak? Many of these skylight issues and other types of water damage to the roof can be prevented through seasonal roof inspections. An inspection contractor will look for damage to the shingles, and gutters, but will also check the flashings for holes, cracks, or other signs of damage or deterioration. They should also check the interior of the house for issues that could be causing your problems. It is best to schedule roof inspections before the winter to make sure your home is ready for the cold and wet. You may want to schedule another inspection in the spring to confirm that your roof and skylight made it through the storms in one piece, and address any necessary roof repairs following this wet season. Taking care of your roof during winter is another way to prevent skylight leaks – roof care is more important in around winter than at any other time of year. This is largely due to the threat of ice dams, which can wreak havoc on your roof and attic and potentially cause major, costly damage. First and foremost, clear your roof of snow as quickly as possible after the storm. Speedy yet safe snow removal does not give the precipitation time to melt and refreeze on the roof, creating ice dams. Ice dams can block drainage to the point that moisture can seep into the home through the roof and skylight. Another factor to consider in regard to your winter skylight leaks is the humidity level in the highest floor of your home. Too much humidity in the air, whether it comes from the laundry room or bathroom, can cause condensation on skylight glass while leading to leaks around the frame. Ask your roofing contractor to suggest an appropriate ventilation system or dehumidifier for your home to prevent condensation. Hire Professional Roofer To Help! Skylight leaks can be tricky and improper repairs can lead to significant interior damage, so it’s best to hire a professional roofer experienced in proper diagnosis & repair. If you notice leaks around your skylight, contact All Roofing Solutions, a family owned & operated local roofing contractor with nearly two decades of experience in residential roofing. We’ll evaluate your skylight and surrounding shingles, and recommend repairs that will fit your budget and remedy your water problems. Call 302-725-ROOF (7663) in Delaware or 610-551-ROOF (7663) in Pennsylvania for your FREE ESTIMATE today!